10.14 A Culture under Siege? 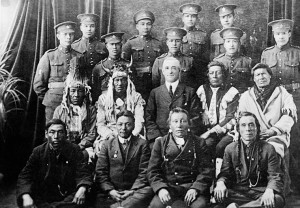 Figure 6.19 Aboriginal soldiers of the Canadian Expeditionary Force (CEF) along with elders, ca. 1916-17. In the first half of the 20th century, Canada’s Status Indians faced many challenges. The Indian Act restricted their freedoms and rights and Canadian society, which viewed Indians as an inferior and dying race, marginalised them economically and socially. Despite this reality, when Canada marched to war in 1914 and 1939, First Nations people joined the national efforts and volunteered for the military. In fact, more than 4,000 Status Indian men enlisted in each World War, the majority as volunteers. Most First Nations were supportive but it is difficult to generalise because the degree of engagement varied greatly, with some communities giving almost every able-bodied man and others almost none. While the Army experimented with segregated all-Indian units in WWI, overwhelmingly First Nations youth enlisted and served as individuals integrated into regular military units. During WWII, racial barriers combined with stringent health and education requirements to bar First Nations from the Navy or Air Force, funneling most into the Army. In both wars, when conscription was enacted it applied to Status Indians, despite their ineligibility to vote and their status as wards of the state. First Nations leaders across the country protested the application of the Military Service Act of 1917 to their people. The government responded in early 1918 by exempting Status Indians from overseas combative service. In WWII, Status Indians were deemed liable for conscription for home defence from 1940-45, despite nationwide protest and passive resistance amongst Indigenous communities. When Ottawa sent conscripts overseas in late 1944-45, only a few First Nations who, during treaty negotiations, were explicitly promised that the “Queen … would not ask her Indian children to fight for her unless they wished,” were exempted. After both wars, Status Indian veterans faced unequal access to benefits and programs provided to help veterans re-establish themselves in civilian life. The extent of First Nations military participation and the meagre reward received for their sacrifices in peacetime raises the question of why Status Indians would volunteer and fight for the state that oppressed and marginalised them. This is challenging to answer as the decision to volunteer differed slightly between the wars and between cultural communities and individuals. During the Great War, First Nations that historically honoured warriors viewed the conflict as an opportunity to reinvigorate such traditions. Although not prevalent everywhere, warrior cultures were important amongst Plains First Nations as well as Iroquoian-speaking communities in central Canada. Perhaps surprisingly, a heartfelt connection to the British Crown motivated many First Nations enlistments; this was a legacy of historical traditions of military alliance with British since the 1600s and/or commitment to treaties negotiated with Crown representatives. Moreover, for almost all, a desire to defend their people’s ancestral territory, and by extension Canada and the British Empire, also spurred enlistment. And of course, many young men’s decisions came down to impulsiveness, a social need to join their buddies, a youthful hunger for adventure, or an escape from restrictive reserve life. Figure 6.20 Michel Ackbee, a sniper from the Thunder Bay Band, during WWI. In WWII, earlier motivations were still evident, but the nature of the conflict was different: this was less an imperial contest and more explicitly a war for democracy and freedom against fascism, oppression, and state racism. This meant Indigenous military service added meaning for both those enlisting and for Canadians who were pleasantly surprised by Status Indians’ patriotism. Volunteering for the military could now be a political act, calculated to win greater respect, to prove one’s worth, or claim enhanced rights. Highly decorated First Nations soldier, Sergeant Thomas Prince, stated that he “wanted to show they [Indians] were as good as any white man.” At home, Status Indian leaders argued that “if our young men are good enough to wear the King’s uniform,” they should have the “same civil rights and privileges as our white brothers have.” The connection of military service to democracy made such arguments difficult for Canadians to ignore. First Nations people were deeply moved and motivated by the fight against fascism and wanted to participate in what became a national crusade. Canadians, and their government, typically misinterpreted the First Nations’ wartime support and contributions as evidence of their willingness to assimilate into mainstream society after the war. While they wished to take part and be accepted, First Nations people were also declaring their right to be, and to remain, distinct cultural communities. Figure 6.21 Brothers Tommy and Morris Prince – a sergeant and a private, respectively – at an event at Buckingham Palace, 1945. After 1945, First Nations delegates took part in the post-war Parliamentary review that led to a new Indian Act in 1951. While far from revolutionary, the revised Act eased some restrictions on Status Indians and extended some powers to Indian Band Councils. Overall, however, Status Indians remained on the margins of society, subject to assimilation, and denied a federal vote until 1960. Was their contribution to Canada’s war effort worth it? Aboriginal people were marginalized, oppressed, and neglected by the Canadian state and yet many took up arms in support of Canada’s effort in the two World Wars. Conscription applied to Status Indians, a fact to which many First Nations people objected. 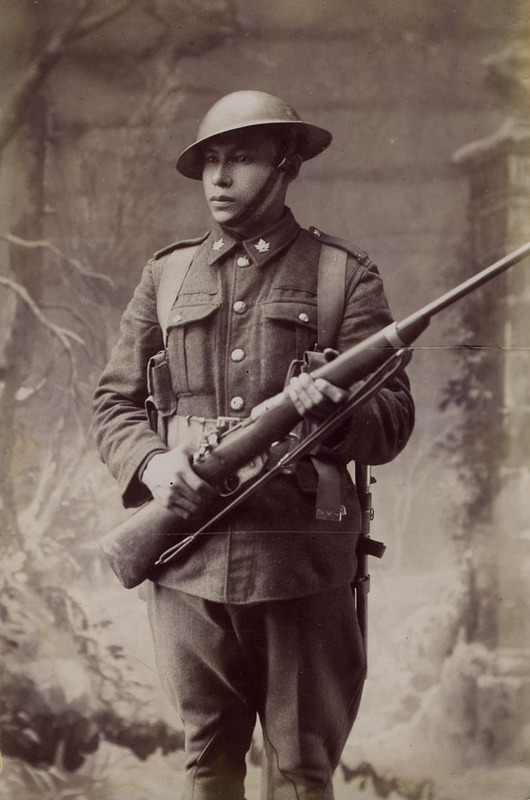 Resources made available to non-Aboriginal soldiers after demobilization were not extended to Status Indian recruits. Aboriginal people took advantage of the Second World War’s pro-democracy rhetoric to advance their own agenda for greater liberties and recognition in Canada. Despite the contribution made in wartime, fifteen years would pass between the end of WWII and the enfranchisement of Status Indians. Elders and Indian soldiers in the uniform of the Canadian Expeditionary Force (Online MIKAN no. 3192219) by Library and Archives Canada / PA-041366 is in the public domain. WAR 1914 – 1918 – ENLISTMENTS AND WAR ACTIVITIES OF INDIANS (PHOTOS OF INDIAN SOLDIERS) (Online MIKAN no.2095973) by Government is in the public domain. 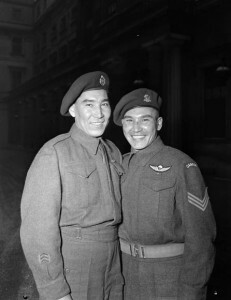 Sergeant Tommy Prince (R), M.M., 1st Canadian Parachute Battalion, with his brother, Private Morris Prince, at an investiture at Buckingham Palace (Online MIKAN no.3191550) by Christopher J. Woods / Canada. Dept. of National Defence / Library and Archives Canada / PA-142289 is in the public domain. 6.12 Status Indians and Military Service in the World Wars by R. Scott Sheffield, Department of History, University of the Fraser Valley is licensed under a Creative Commons Attribution 4.0 International License, except where otherwise noted.